Gutsy reporter, Lark Chadwick always seems to find herself at the wrong place at the right time. In Bullet in the Chamber, she is front-row center when the executive mansion’s press briefing room is suddenly attacked. The president is missing, the first lady’s life is at risk, and Lark’s personal life is falling apart when the man she loves disappears. 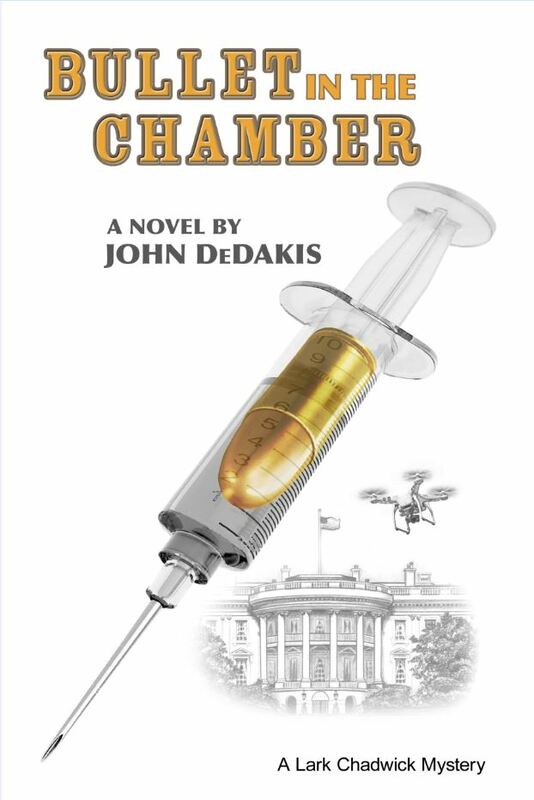 In Bullet in the Chamber, author John DeDakis draws on his own personal pain the sudden death of his twenty-two year-old son Stephen in what promises to be a true page-turner. DeDakis also draws on his forty-five year journalism career. He shows the daily struggles that go on behind the scenes in day-to-day, deadline-a-minute journalism. SKU: SM21637. Category: Fiction. Tags: fiction, John Dedakis, journalism, mystery, reporter. John DeDakis is a former Senior Copy Editor on CNN’s The Situation Room with Wolf Blitzer. During John’s 45-year journalism career (25 years at CNN), he has interviewed such notables as legendary film director Alfred Hitchcock, and former presidents Ronald Reagan and Jimmy Carter. DeDakis, a former White House Correspondent for CBN News during the last three years of Reagan’s presidency, has been an adjunct journalism professor at the University of Maryland – College Park and writing workshop leader at The Writer’s Center in Bethesda, Maryland. Bullet in the Chamber is his fourth novel. What happens when you pair a cub reporter with murder, mayhem and a handsome bad boy? A great read. Once again, John DeDakis proves he knows how to write a gripping thriller. I loved it. ~Jillian Harding, CNBC. Strategic Media is distributed in the US and Canada by Cardinal Publishers Group. In Hoosier Hoops and Hijinks, the matters of the game can also turn deadly. This collection of seventeen mystery stories written by the Indiana Speed City Chapter of Sisters in Crime honors Indiana basketball and its rich tradition while weaving in the mischievous and sometimes lethal passions that can erupt when the state is gripped in b-ball fever. Tucked between the fictional stories are pages about real-life legendary Hoosier basketball players and coaches.